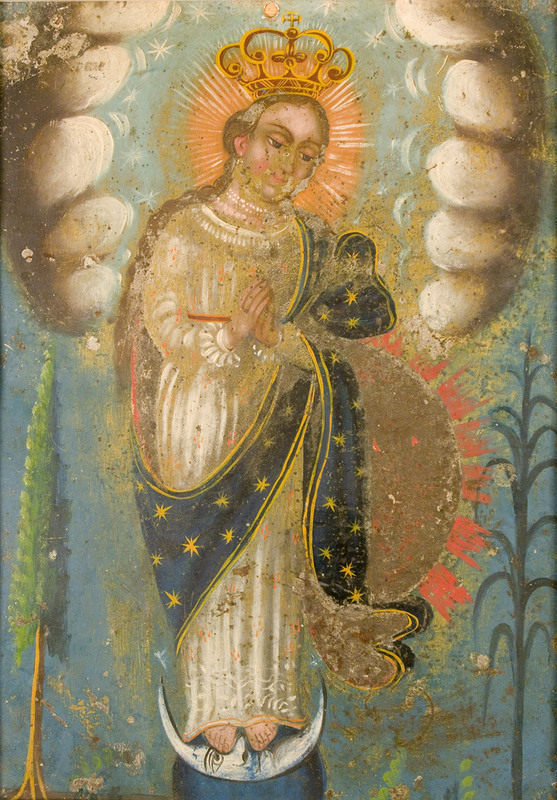 Since the mid-fifteenth-century the Virgin was frequently shown as Saint John’s version of the Apocalyptic Woman, “…a woman clothed by the sun and the moon under her feet and upon her head a crown of twelve stars.” In this retablo, Mary is standing on an upward curving crescent moon, indicative of her purity. The crescent moon is resting on the Earth and behind the Virgin is the Sun. To the Virgin’s right- hand side is a cypress and to the left is usually found a palm frond, however the palm has been replaced with a cornstalk. The cypress is symbolic of death and the palm or in this case the cornstalk signifying triumph over sin and death.